We didn't think they'd even open the door. But within a few minutes, the entrance to the Chinese Consulate in San Francisco opened and a representative emerged. 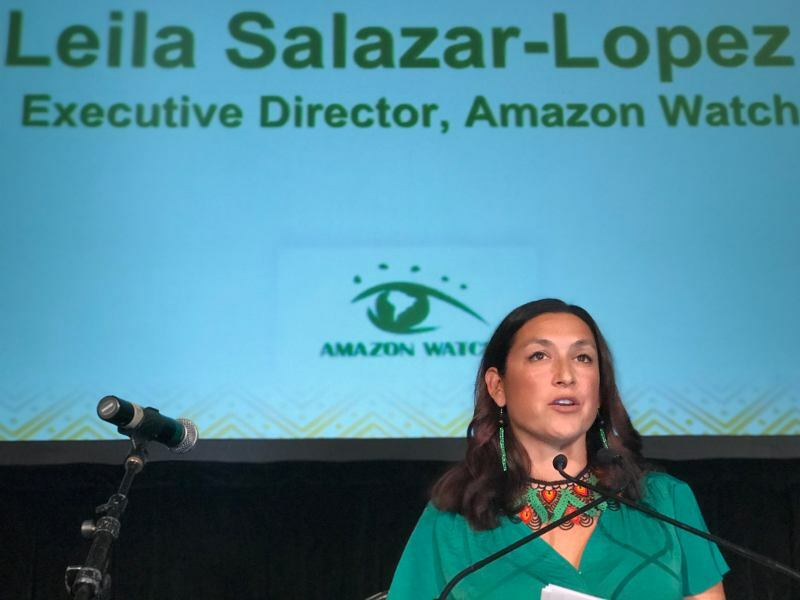 Sápara leader Gloria Ushigua thrust an envelope into his hand, telling him – via interpretation provided by our Executive Director, Leila Salazar-Lopez – that she had traveled all the way from the Ecuadorian Amazon to deliver a message from her people. The letter demanded that Andes Petroleum immediately cancel its contract to explore and drill for oil in Sápara territory. Gloria and the Sápara wrote the letter in response to plans by the Chinese oil consortium Andes Petroleum, a wholly-owned subsidiary of China National Petroleum Corporation (CNPC) and China Petrochemical Corporation (SINOPEC), to drill for oil on their titled territory – without their consent. Amazon Watch and dozens of Indigenous and grassroots activists rallied beforehand at the consulate, along with local allies such as Asians in Solidarity with the Struggle for Indigenous Human Rights, Indigenous Environmental Network, American Indian Movement West, and Friends of the Earth. 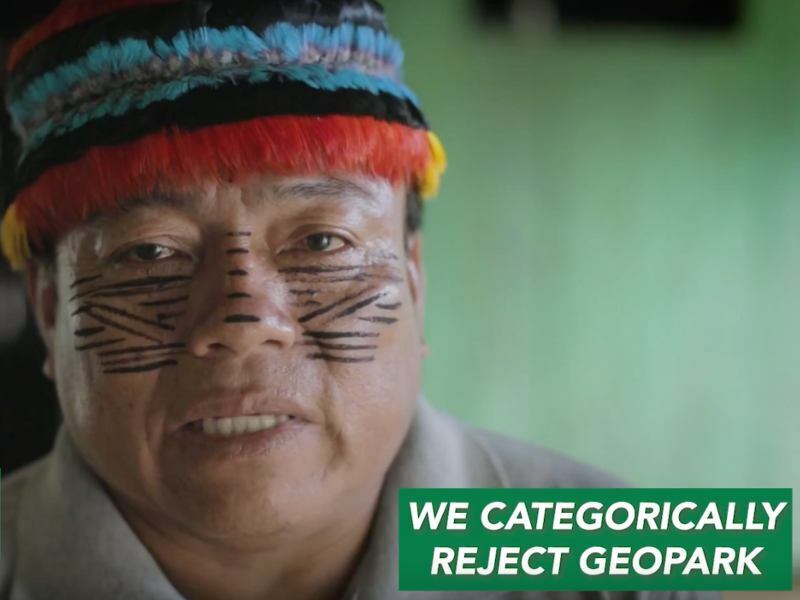 "Andes Petroleum will have the blood of my people on their hands if it doesn't stay out of our sacred rainforest," Gloria has said. 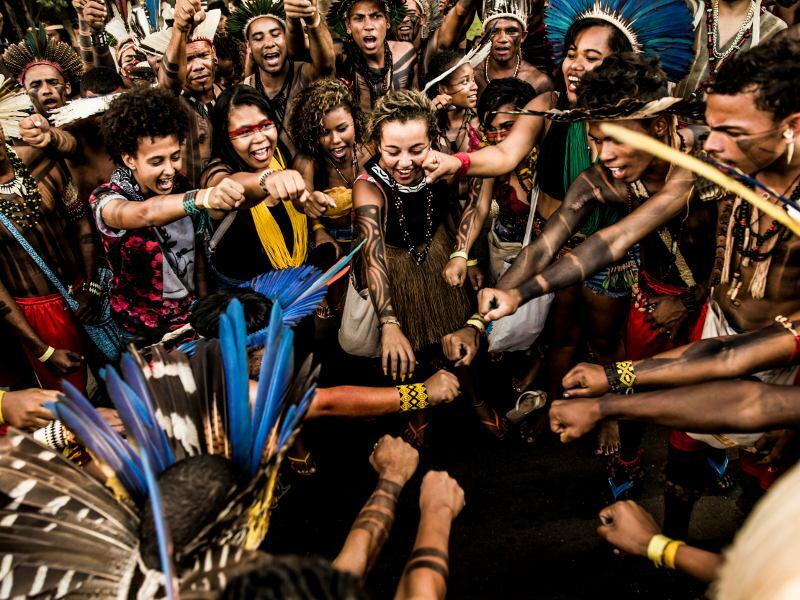 "The survival of the Sápara Nation and indigenous peoples living in voluntary isolation depends on the health of our rainforest, rivers, mountains and biodiversity, where our spirits are born." The contracts that Andes Petroleum bought from the Ecuadorian government in January 2016 permit it to explore and drill for oil in an area that covers almost the entirety of Sápara territory and also overlaps with the territory of other indigenous people living in voluntary isolation. 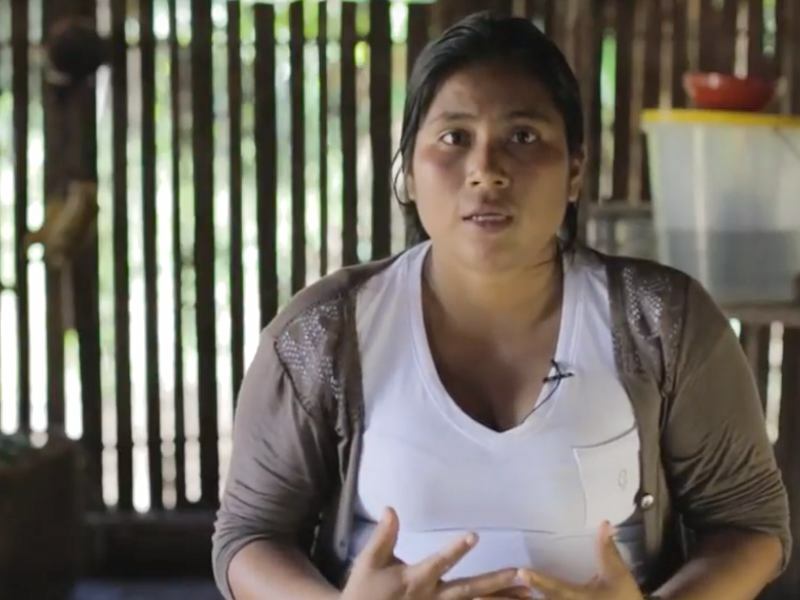 Gloria and other Sápara leaders have tried to deliver such letters to the Chinese government before, both in and out of Ecuador, but to no avail. This was the first time the Sápara have actually managed to engage directly with a Chinese government official, and Gloria deemed it important progress. "I feel good about the action and the letter delivery. Something good will come of this. I believe we will win!" During her visit to the Bay Area, Gloria also built important relationships of solidarity and unity. She joined a public signing of the Indigenous Women of the Americas Defending Mother Earth Treaty, which declares solidarity in the movement to protect Mother Earth from extractive industries. Gloria also joined the Bay Area's final Refinery Healing Walk. Organized by our allies at Idle No More SF Bay, the Healing Walks seek to raise awareness about the five refineries in the San Francisco Bay Area, bring attention to the negative health effects of living near a refinery, and make the connections between frontline community members here and frontline Indigenous communities affected by the fossil fuel industry from the tar sands in Alberta, Canada to the Ecuadorian Amazon. This final Walk passed a Kinder Morgan facility and the Chevron Refinery in Richmond, CA. 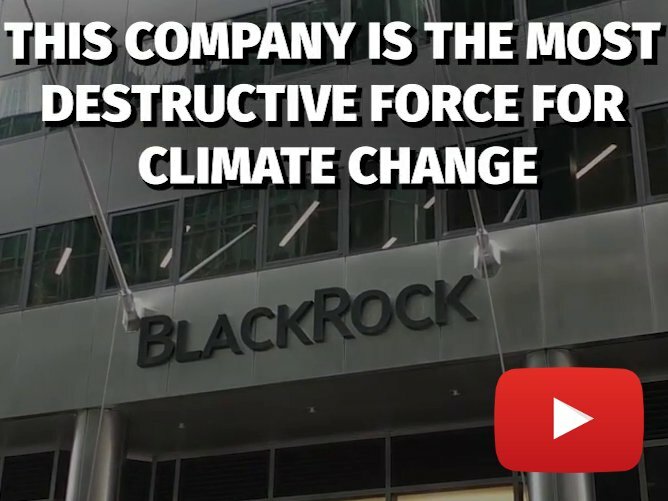 Chevron, of course, is the company responsible for the largest oil-related environmental disaster in the world, the decades-long dumping of oil and drilling waste into the Ecuadorian Amazon. And the Chinese Consulate in California was a particularly apt place for the letter delivery given that roughly 50 percent of Ecuador's Amazon crude exports makes its way to California. That crude oil is then processed in California refineries and sold throughout the state, meaning that those on the Healing Walk likely passed by pipelines carrying crude oil from the Amazon. "I don't want our land to become polluted, like this land by the refinery. 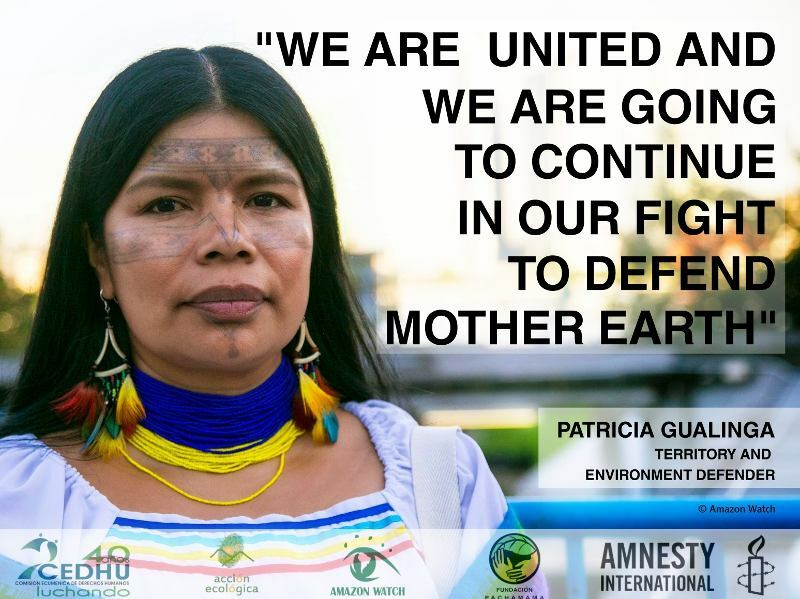 We are all fighting for our survival, to protect our little pieces of land," said Gloria.